Hampden Deli is an environmentally conscious business always looking to minimise our footprint on the environment. Packaging is a much needed component of our Deli, so we have taken the time to ensure we currently have the best compostable and recyclable packaging. We encourage you to bring your own reusable cups, cutlery and lunch boxes with great Deli discounts. We have an emphasis on reusable kitchen packaging and minimalising food waste. We use organic and fair trade products where and when available and have our own kitchen garden to minimise food kilometres. We offer recycling specific bins on site, so once you have enjoyed your picnic please use them. Our used coffee grind is perfect for your compost- come by to scoop your own free bag! We ourselves are learning each day how to keep Kangaroo Valley beautiful, we’d love to hear your tips please email us at info@hampdendeli.com.au. Nick started his apprenticeship at the one hat restaurant in Nelson Bay called Zest. 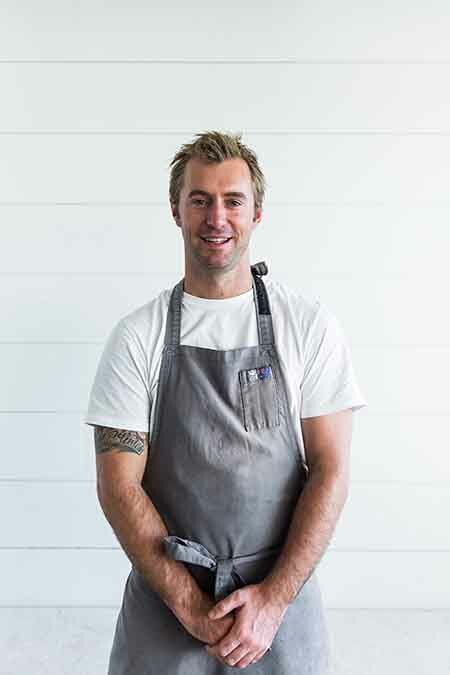 After 2 years he accepted an offer with Quay restaurant where he finished his apprenticeship and continued working under Peter Gilmore and Sam Aisbett for 3 years. Once qualified and brimming with skills he was ready to travel. Nick cooked in Canada for a year where he met Stevie. They travelled down to America, where he worked at the world famous restaurant, The French Laundry and Thomas Keller’s second restaurant, Bouchon both in the Napa Valley, California. After nearly 2 years abroad, the internationally known Tetsuya’s Restaurant was the next fine dining establishment Nick landed at and it wasn’t too long before he was promoted to Sous Chef. During his time there, he was put forward and won the award Sydney Morning Herald Young Chef of the Year – 2013. Nick took this opportunity to head to Europe and spent many months working in some of the top three Michelin Star restaurants in the world. These included, Arzak in Spain, De Librije in Netherlands, Tom Aikens in England and Restaurant Fratzen in Sweden. After returning from the overseas venture, Nick and Stevie relocated to the beautiful south coast, NSW. Nick helped setup the new Silos Restaurant in the role as the Head Chef. Nick went on to maintain a high standard of both wedding preparation and fine dining restaurant service. After two years, Nick Gardner accepted the role as Head Chef at Eschalot Restaurant where he and his team helped the restaurant to achieve a converted SMH Chefs Hat, one Nick is very proud of today. Stevie-Lee Bounader has always loved food, her lunchbox was always empty by first break at school and her university days were spent coming up with delicious but healthy snacks for on the run. When she partnered up with Chef Nick Gardner her dining experience only grew stronger through her life shared with a chef. Stevie has travelled and tasted many of the world’s different cuisines. Her favourite dish however still remains – her Mum’s mashed potato. Stevie has over a decade of experience in front of house and managerial roles in hospitality from cafes and cocktail bars to working with hatted Chefs in fine dining restaurants. As well as being on the receiving end of some of the world’s greatest Michelin restaurants and hatted restaurants both in Australia and worldwide. Stevie has a fine dining attention to detail with a warm hospitable personality and country approach. Her dynamic role means she takes care of all things beverage, from coffee to wine and service in the deli. For all your private events, she knows what guests need and can offer you many tips and suggestions for your catering. She also knows how to handle a chef and keep her partner Nick in the kitchen on task. Nick and Stevie have worked together previously in many establishments where their two key roles align to create a high end and unique experience. They are thrilled to bring Hampden Deli, Dining & School to Kangaroo Valley together. PLEASE NOTE *In the event of a dining or school event we may be open outside of these hours. For all general enquiries please use the form below. If you wish to book catering please fill out the form on our contact page.